Euro breakfast here we come. Great to head downstairs for some food and some coffee. A few more people here this morning. Tourism is a pretty dynamic thing. I’ve suggested we try and look for some music memorabilia amongst other things. On to the internet and google maps, and bang……….The Monster Melodies Shop comes up. We head for the MM Shop just off the Boulevard de Sebastopol, and here we are. Upstairs, a lot of vinyl. I’m really looking for posters, particularly posters reflecting the golden age of jazz here in the late 50s and early 60s. Look online through our site I’m told. Ok then. We move further down Sebastopol and decide to check out a prominent legal/ justice site in the history of France and the revolution of the late 1700s. Only problem? The queues. We queue for an hour to get into the Chapelle. The site is labelled Saint Chapelle (on Sebastopol). The building style (from 1242?) is classic gothic. 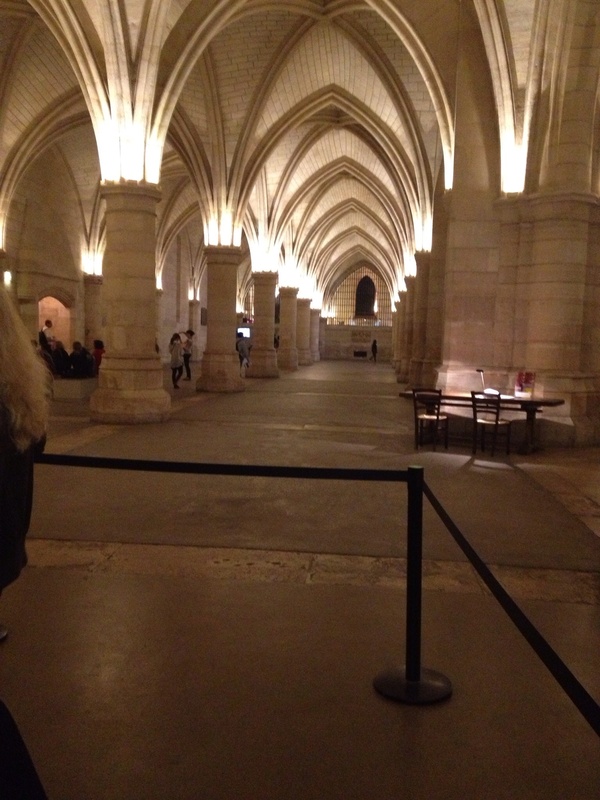 Part 1 of the tour involves going through a Concierge area where Marie Antoinette was held and tried (?) along with thousands of others (she was ultimately executed in a major public square not too far away). 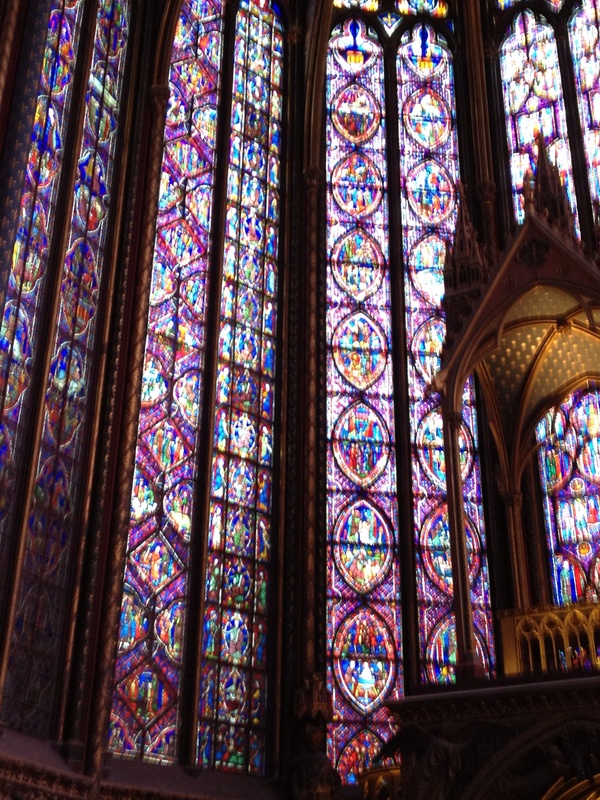 Part 2 involved a look through the Chapelle with the most amazing massive stained window displays. Out of the Chapelle on to the Seine. 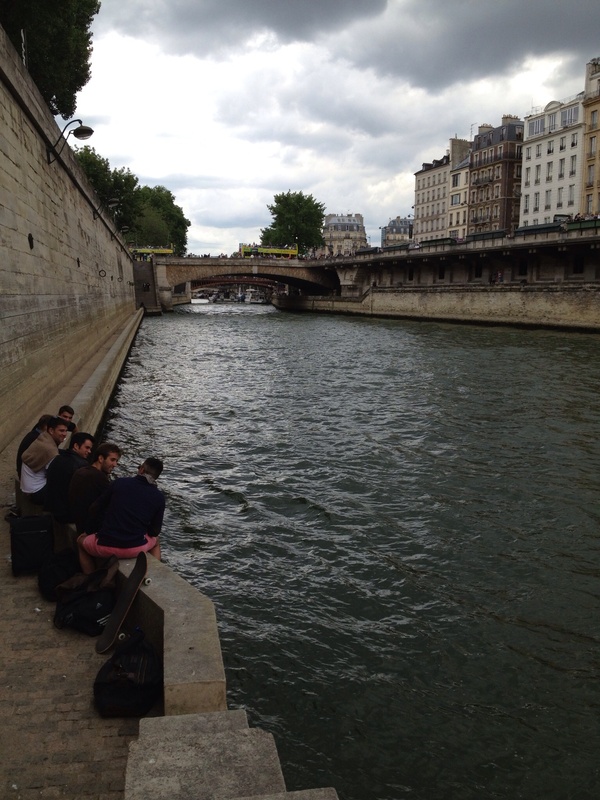 Grab a snack and sit by the Seine. Watch the long tourist boats go through. I pick up a couple of rock posters from some vendors on the side of the Seine. We head back uptown and Sue picks up some perfume. Back to the hotel. 1. Gendarmes look pretty scary. 2. No helmuts for beautiful young female bicycle riders. 3. Traffic is seemingly all over the place, yet people seem to accommodate each other and it all seems to work. 4. Stories of Presidents past is worth a look. One was actually committed to an infirmary for a variety of things including greeting dignitaries wearing nothing but his medals. 5. Queues are a fact of life at the major historic sites. Prebook if you can. 6. Crowded footpaths and the dodging game. 7. The ultimate “hang” capital where people smoke, talk and drink for infinite amounts of time. Who is doing the working? Out to dinner. Another day. ~ by gazlington on May 31, 2014.